The use of essential oils in aromatherapy can be effective in supporting the weight loss process. Every diet and weight loss book, website and guru tries to offer something new to the debate about how to lose weight. The weight-loss industry is a fast-growing, multi-billion dollar industry and shows no sign of slowing down. For decades there has been an assortment of outlandish and unhealthy fad diets circulating - the Cabbage Soup Diet, the Grapefruit Diet, the Brussels Sprouts Diet, even the Tape Worm Diet - but the fact remains that the most sensible way to lose weight is to watch what you eat and get regular exercise. Every body is different and the amount of weight gained or lost will depend on such things as an individual's metabolism rate, their genetics, their ability to exercise and their overall health. Essential oils by themselves will not induce weight loss but they can help to support and be a comfort through a change to a healthy lifestyle. Essential oils, such as grapefruit (Citrus paradisi), can be used as a diuretic and a digestive stimulant. Others, like lavender (Lavandula angustifolia), are anti-inflammatory, which can help to reduce inflammation caused by exercise, and lemongrass (Cymbopogon citratus), which can aid with circulation. It is commonly believed that both peppermint (Mentha piperita) and pink grapefruit essential oil can help to reduce food cravings and suppress the appetite. Grapefruit is sometimes referred to as "the dieter's friend." Basil (Ocimum basilicum) essential oil is analgesic, anti-depressant and anti-inflammatory, helping to uplift the spirit and reduce inflammation. Fennel (Foeniculum vulgaris) essential oil is a detoxifier, diuretic and stimulant. Grapefruit (Citrus paradisi) essential oil is a detoxifier, digestive stimulant, emotional stimulant, and diuretic. Juniper (Juniperus communis) essential oil is a detoxifier, diuretic, and works well to reduce cellulite. Lavender (Lavandula angustifolia) is an analgesic, anti-anxiety, anti-inflammatory, balancing and calming essential oil. Lemon (Citrus limon) essential oil is anti-bacterial and anti-depressant. Lemongrass (Cymbopogon citratus) essential oil is an antioxidant, digestive tonic and it is used to energize and stimulate circulation. Orange (Citrus sinensis) essential oil is anti-depressant, lymph stimulating, tonic and uplifting. It is thought to eliminate toxins. Petitgrain (Citrus aurantium var. amara) essential oil is an antidepressant and a sedative. It is also known to help with insomnia and nervous exhaustion. Rosemary (Rosmarinus officinalis) essential oil is an analgesic and diuretic. Use the essential oils singly or blend them together. Try them (diluted in bath salts or a tsp. of honey) in a bath, in an aromatherapy diffuser or add them to a carrier oil and use in a massage. Holistic Health News, "Stop Your Sweet Cravings Fast with Pink Grapefruit Essential Oil". Worwood, Valerie Ann. 1990. "The Fragrant Pharmacy"
Barb Greenwood hails from England where she worked in Special Needs Health Care. Already a Registered Massage Therapist, she became Certified in Aromatherapy in 1990. In 1992 Barb moved to Canada, where the idea of her own essential oil import/export business was conceived. Today, Barb is the creative head of a dynamic and forward thinking company, Green Valley Aromatherapy, which enjoys the highest reputation for quality of products and integrity in business. Her attention to detail has ensured consistent, best quality products and ethical business dealings. Barb's wealth of aromatherapy knowledge is the backbone of Green Valley Aromatherapy. She continues to update her knowledge of aromatherapy and maintains an active membership in the BC Association of Practicing Aromatherapists (BCAPA) and the BC Association of Aromatherapy (BCAOA). 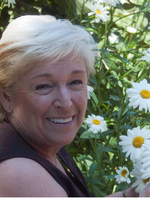 Barb is a Registered Massaged Therapist (RMT), Registered Aromatherapist (RA®), and an Essential Oil Therapist - EOT™. November 2010 Reprinted with Author's permission. Dr. Alan R. Hirsch, MD a neurologist and Researchers at the Smell & Taste Treatment and Research Foundation in Chicago, IL conducted a six month clinical trial using a blend of Peppermint (Mentha piperita) and green apple and banana fragrance. In this trial participants were told to not change their dietary or exercise habits. At the end of the trial, people had lost on average just nearly 5lbs. each month. I used to do aromatherapy for bariatric unit for the Skilled Nursing Facility in Andover, Ohio that was featured on Discovery Health television several times. The clients I worked with there had seen an article in Fitness Magazine (November 2004) and asked me to duplicate it for them. We had a reasonable amount of success with it for those who used it regularly. Of course we also had the people who put it into a drawer and then complained that it didn't work. Most of those were also the people who said they weren't addicted to food, it "just got away from them". In case you aren't familiar with that facility, the average admission weight was just over 575 lbs. This is a place where NAHA members and prospective members can come to learn about what's happening in our organization. As members please feel free to share your ideas and experiences in regards to Aromatherapy. We hope you will find this site useful and informative! Questions about essential oils, aromatherapy uses etc? Please do not post these types of questions to the blog. We want to make sure that your inquiry is not missed and that you receive an informative response in a timely manner. If you have a specific question about essential oils, hydrosols, aromatherapy products, how to use oils for certain issues etc. Please use the NAHA Online Feedback Form to submit your inquiry. Once the Feedback Form has been received it will be sent to either the NAHA Regional Directors or Safety Committee for their feedback, suggestions or answers to your question/s. You can also use the NAHA Online Feedback Form to submit your questions or to update your membership contact information.